I am shocked when I see budgets in bridal magazines about how much couples are spending on their weddings. It seems that $30,000 weddings have become the norm and somehow my $10,000 wedding is considered cheap. Many of my friends I’ve talked to about our budget think it’s going to be impossible for me to plan the whole thing for under $10,000. Luckily, I have discovered through travel rewards that getting more for less is entirely possible. All it takes is a little bit of upfront effort and you can save thousands. Below is our strategy for saving money on our wedding. Fewer couples choose winter weddings which means less competition for dates and lower prices. When we compared prices by season, we found that our favorite venue was $3600 less expensive to rent out in the winter than in the summer. Another venue we were looking at offered a $20 per person incentive package to book a date in the winter. That’s a $2000 savings for a 100 person wedding! We were thinking about having a winter wedding anyways since we wanted to do something different for our wedding, so this was not a big deal for us. We’re excited about the idea of a winter wedding! January and February dates seemed to be least expensive out of the year. Many of the more expensive venues we looked at offered significant discounts in this price range. For couples who have their eye on a certain venue and are more flexible on time of year, this can be a great strategy. The one caveat though is that prices go up during the holiday season. Venues that host corporate holiday parties jack up their prices in December. Prices also go up from Christmas through New Years Eve. Another way we are cutting costs for our wedding is committing the faux pas of having our wedding on a Friday. We cut $1200 having the wedding on a Friday night versus a Saturday night. We feel awful that our guests will be inconvenienced but having the wedding on a Friday was a huge cost-saver for us. Couples that choose Sunday morning brunch weddings and weeknight evening weddings will save even more money. The easiest way to minimize the stress of planning a frugal wedding is to stay in control! I think weddings make even the most well-intentioned people go crazy. I’ve been a little surprised at how passionate my parents will get for example over decisions about the wedding. To avoid potential conflict, my fiancé and I will be paying for the wedding ourselves. My parents and his parents have offered to chip in for the wedding on multiple occasions (especially when we turn down something extravagant that they are suggesting) but we refuse. I find even spending $10,000 on a five-hour wedding kind of silly. It is silly whether the money is coming from my fiancé and I or from our parents. Taking money from your parents for the wedding might also add to your stress. Your parents then become parties to important decisions that can totally alter the wedding such as the guest list and the venue. We don’t want a big guest list. First, catering is often the largest cost in a frugal wedding budget. Keeping the guest list small minimizes that cost. Secondly and almost more importantly, the larger the guest list, the more stressed out I will be during our wedding. We will want to personally thank each and every guest for attending. It sounds awful to say that going round to every table is a burden since our guests are here to celebrate with us and support our marriage, but it’s true. I’m sure many of us have noticed this pattern at large weddings. I recently attended a good friend from college’s wedding and watched as she and her new husband went around to every table to greet guests. When I finally did see her, for two seconds, she admitted that she was really stressed out and that she felt so bad she didn’t get a chance to greet all of her guests. Spending thousands of dollars to be stressed out? No thank you. That sounds very stressful to me. I’d rather have a small wedding where we can spend quality time with each guest. Unfortunately, our families don’t seem to understand our desire for a small guest list. My parents were very upset when I mentioned that the wedding would be small and that I would not be inviting their cousins, their friends, etc. They wanted to invite all of the people important to them and weren’t thinking about the people that were important to us. We were already cutting out people we were close to in order to keep the guest list small. Some family members were also upset that children would not be invited to the wedding. We are having the ceremony and reception at the same location as another cost saving strategy so we couldn’t even invite children to the ceremony and then do an adults-only reception after which some couples do. (We found that churches in that area can be roughly $3,000 for the ceremony – wowza!). I am sure that both of our families will come around but it’s certainly not easy dealing with these reactions. While our family’s reactions to our wedding decisions have been unpleasant to deal with, we understand where they are coming from and forgive them. They love us and it’s coming from a good place. The best strategy we have used when these situations happen is to just stay firm and not react to our family’s challenges. If we get all worked up (which admittedly is difficult to avoid at times) we will carry too much stress which is not healthy. Can we successfully hack our wedding? Our ultimate goal is to hack our wedding. We’ve figured out how to save on travel, how to hack my engagement ring, it’s only natural that we figure out how to hack our wedding too! Our next step is figuring out how to save money on vendors! Readers, do you have any wedding planning tips? 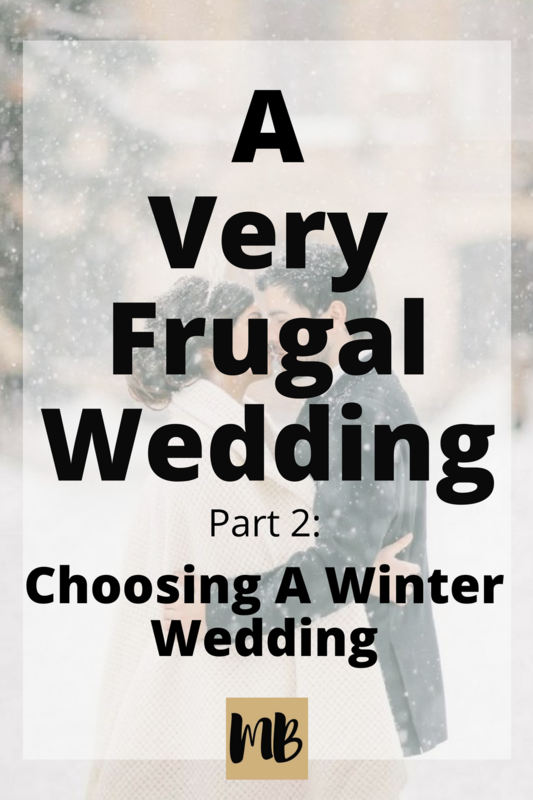 How did you plan your frugal wedding? I’m so envious that you and your fiance are putting your foot (feet) down and sticking to it! 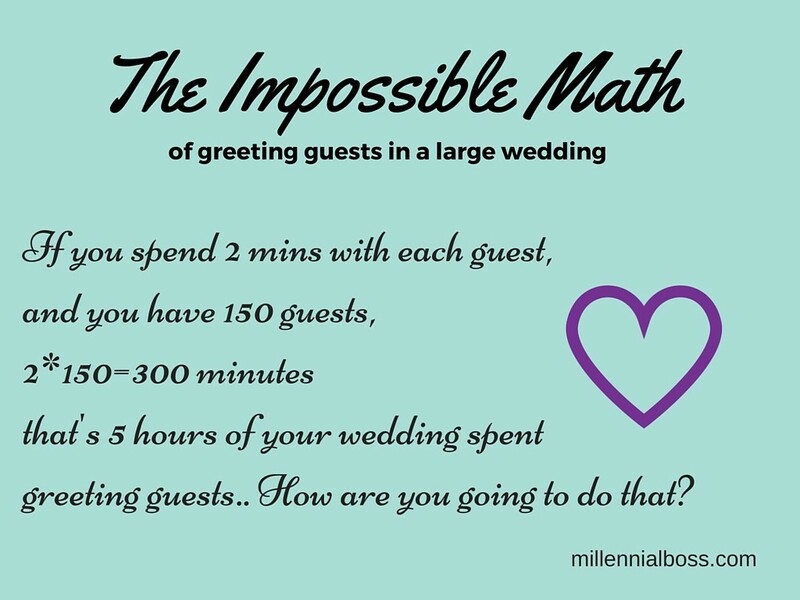 A 70 person guest list is my dream wedding situation, but with 120 relatives alone…well…it just wouldn’t happen. You’re so right to think about it in terms of time spent speaking with people and I often lament to my boyfriend* that if we had 75 or less, it would all be people we actually care for and want to spend time around. Best of luck with planning and I look forward to reading more about the process. *We’ve been together nearly 6 years but aren’t engaged primarily because I asked that we put it off for a while as I don’t want to deal with planning a wedding… Sad, but true. Thank you! It’s been hard to keep the stress away! I’ve realized weddings are a topic that people have strong opinions about – sometimes it feels kind of like discussing politics or religion but on a smaller scale. I had pictured being engaged as such an exciting time (and it is!) but unfortunately it’s stressful too since you feel like you can never make everyone happy. Well, I was on the same page with you for the most part… a little over a year ago we had a small non-traditional wedding and super fun but non-traditional wedding rings, etc. But some of your post kind of rubbed me the wrong way. There’s “we don’t want any one else to help us out monetarily” vs “Yeah, they’ll have to take time off work but it’s worth it to us because we save money.” Those two things are really at odds. The work day *is* money for people. That 1200$ being saved isn’t actually being saved, it’s being off-loaded onto other people. 12 people losing out on $100 for a day of work *is* $1200. And that’s fine, it’s your choice to do your wedding however you choose, it just seems disingenuous to me for you to trumpet the frugality of that saved $1200 when it hasn’t been saved, it’s just been pushed onto others. And I guess it just bothered me extra because earlier you wrote that it didn’t matter *who* was doing the spending. For us, our wedding was family only, and some of the 10K that we spent involved accommodations for the side of the family that came in from 3000 miles away. But our wedding didn’t *cost* 10K: we didn’t pay their airfare (or their day off work for the Friday they flew in). So, that cost was offloaded onto other people. In reality, our wedding cost more, and other people shouldered that cost. Anyway, I’m all for frugal weddings (and even splurging on some stuff, if it is something important to you!) and I wish you all the best for yours. That is a great point that I hadn’t thought of about the vacation time technically putting the cost onto the guests. I am trying to be as accommodating as possible to guests and the wedding party (not having the wedding in our home state, having bridesmaids pick whatever dresses they want, etc) but unfortunately it’s seeming more and more impossible. That was great that you got accommodations for the traveling side of the family. My fiance and I were thinking of renting a house for the traveling side so they didn’t have to worry about that cost. I am getting married in less than a month and like you we are paying our own. We’re having less than 100 guests. When we announce it, I basically told our families that our wedding will have 100 guest MAX. To be honest, I even want something less, but like you I do think that the wedding is not just for us but also for our family. We have three priorities: location, food and beverage. The wedding will be in the city, by the water with good food and open bar. We’re lucky to find a place that allowed us to bring our own alcohol. Everything else, I really don’t care about. Basically, if I remember from the past weddings I’ve been at, then i might consider, if not, it will not happen on mine. Where are you getting your wedding dress? Mine is “pre-loved” 🙂 Good luck! Congratulations on your upcoming wedding! Sounds like you figured out a way to craft a day that is perfect for you two! Good move on finding a place that lets you bring your own alcohol. We are using a required vendor for the venue. Not too expensive though because you can return any unopened bottles and we’re probably just doing beer and wine for the open bar. My dress was actually from a trunk show. I had tried on dresses and then came back when that particular designer had a trunk show at the bridal shop. Kudos on going the pre-loved route. I have a friend going that route and I am certainly envious of the cost. Dress is beautiful and fraction of the price! This sounds very exciting! We had 75 day guests to our wedding, and everyone was fine with it luckily. Once you’ve decided on a dress, try and find it second hand! I wish I had done that. Haha that sounds AWFUL! I’ve never been to a cash bar wedding and don’t want to go to one! Hello Millennial, great share! You are a very good blogger. I love your post that you have shared about winter wedding. It’s very useful for me because I am also getting married in winter. Thank you.